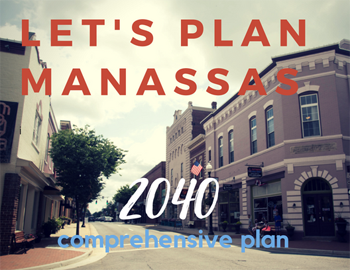 Using an 18-month process, the City of Manassas will update its Comprehensive Plan–the City’s key policy document for land use, development, preservation and related economic and social issues. As part of that update, the City will also develop its first Transportation Master Plan to guide future transportation investments and improve mobility in the City. This is an exciting time for City residents as the Manassas community envisions its future! Citizen input in updating the Comprehensive Plan is vital to a more livable Manassas. 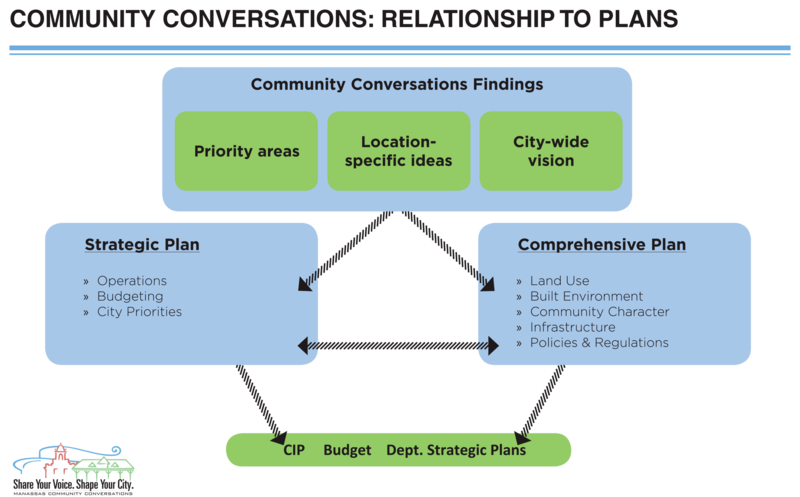 Throughout the summer and fall, the City will host a second round of Community Conversations on key topic areas, like land use and transportation. These conversations began on June 19th with a visioning session on land use. Additional meetings are scheduled throughout the summer and fall. City Staff will also be available to meet with neighborhood and community organizations to gather feedback. Please contact 703-257-8223 for more information about hosting a meeting. Tuesday, June 19th– 7 PM @ Boys and Girls Club, 9501 Dean Park Ln. Please visit www.manassascity.org/planmanassas for additional information and additional meeting dates. As part of the ongoing Comprehensive Plan update, the Prince William County Planning Office has created several small area plans to guide development in key areas of the county. Each small area plan may offer opportunities for improved transit, increased open space, and greater walkability. Public outreach will be accomplished through one or more public meetings and design charrettes for each project. A charrette is a collaborative planning session among a project’s various stakeholders – in this case, government officials, consultants and/or developers, and interested members of the public. A planning outline and some anticipated outcomes are provided for each active plan at the links below. There are no upcoming public hearings or charrettes currently scheduled, but the Planning Department promises to update the website when they have been. We will monitor the website as well. The basis for this project is two studies completed earlier this year: one by the Dale City Sustainable Design Assessment Team (SDAT) and the other under a Metropolitan Washington Council of Governments (MWCOG) Transportation/Land-Use Connections (TLC) Program grant. The scope of the studies includes redevelopment of both the Dale Boulevard/Minnieville Road intersection and Mapledale Plaza at the intersection of Dale Boulevard and Queensdale Drive, as well as extensive redesign of vehicular, cycling, and walking infrastructure throughout the area. An examination of the Innovation Park area and a couple of miles of Prince William Parkway between Sudley Manor Drive and Godwin Drive/Nokesville Road, with the goal of developing Innovation Park as an economic center for PWC. Covers US-1 between Occoquan River and Occoquan Road, north to I-95 and south to Belmont Bay Wildlife Refuge. The major issues appear to be the US-1/VA-123 interchange and multi-modal transportation options. There is currently very little usable infrastructure for non-motorized traffic in this area. An update of the existing Parkway Employment Center sector plan at I-95/Horner Road/Prince William Parkway. A .pdf of the 2008 sector plan is available here. There is not a lot of information available for this plan yet. It will include a bike path along US-29 between US-15 and Somerset Crossing. Future SAP projects include Independent Hill, Triangle, Yorkshire, and Fairgrounds/New Dominion. Ryan Foster (rfoster@pwcgov.org), Community Development Manager, and David McGettigan (dmcgettigan@pwcgov.org), Long-Range Planning Manager, are the primary points of contact for questions or comments. Active Prince William is a group of concerned citizens who advocate for improving opportunities, support, and infrastructure for active transportation and healthy lifestyles within Prince William County, Manassas, and Manassas Park. We are interested in helping to make Prince William County and Greater Manassas a more livable and sustainable Community. The City of Manassas is holding a series of “Community Conversations” to gather ideas, priorities, and visions for the community’s future from individuals, families, neighbors, business professionals, and community leaders. This is your opportunity to shape Manassas by sharing your perspectives and providing input on key topics such as quality of life, services, transportation, land use, and economic development. This community engagement process follows up on the City’s 2014 and 2016 community surveys, in which the following 10 community priorities were identified in order of importance. 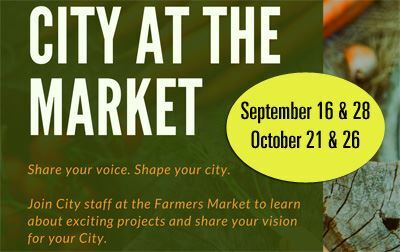 You can also engage with City staff at the farmers markets in downtown Manassas on September 16 and 28 and October 21 and 26. In addition, you can participate online through the City’s new online engagement portal! The Community Conversations will dig deeper into the “why” of the top priorities to find location-specific issues and gauge if any priorities are missing from the list generated by the survey. The findings from both the survey and the Community Conversations will assist the City in updating its strategic priorities and comprehensive plan. Join the conversation! 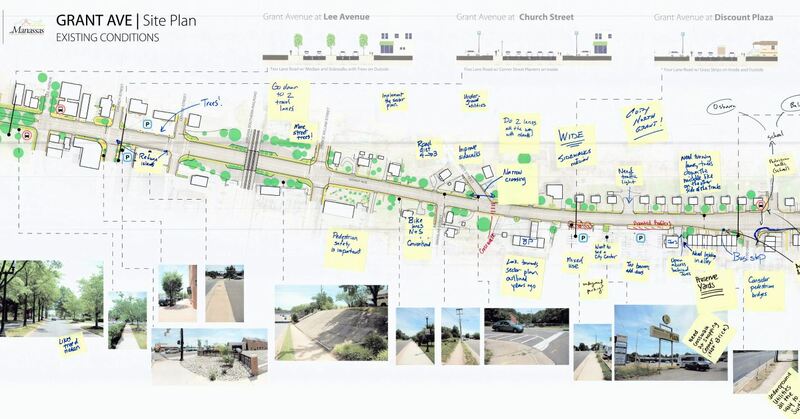 The City of Manassas is in the planning stages of a redesign of Grant Avenue, a road considered the southern gateway to downtown Manassas. Citing pedestrian safety and safe routes to schools, City staff are considering a road diet from 4 to 3 lanes with improved pedestrian sidewalks and crossings. A public meeting was held on 29 June with additional public engagement in the planning process to come in the future. Implementation of the Grant Ave Streetscape Project will also enable the city to move forward with smart growth re-development on the southern side of the city. 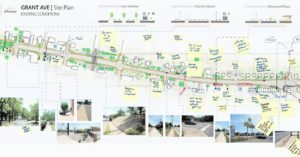 At the public meeting on 29 June, there was considerable staff, consultant, and community support for implementing a four-lane to three-lane road diet to improve walking and bicycling conditions, enhance bus stops, and increase aesthetics without significantly degrading motoring. Mayor Parrish, three current City Council members, and senior City staff were present at the meeting. At the meeting, staff guided interested individuals in using the Streetmix computer program to design alternative cross sections for Grant Ave. While conventional bike lanes are eminently feasible and should be adequate for many bike riders with a road diet’s traffic-calming influence and a lowered 25 MPH speed limit, it was clear that the current street right of way is constrained, and expanding the sidewalk areas to include planting strips with street trees, urban street lamps, and bus shelters is an important “competing” priority that may preclude adding buffered or separated bicycle lanes. Manassas Grant Ave view near Brent St. 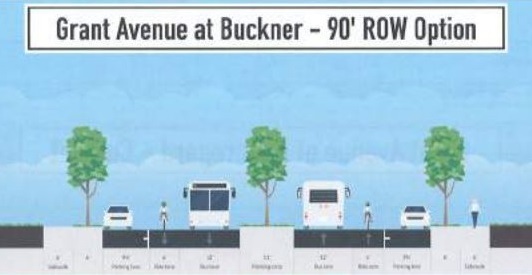 While a simple road diet can often be accomplished using only maintenance funds to repave and re-paint the new lane configuration, expanding the sidewalks and planting strips, undergrounding the currently overhead utilities, and adding bus shelters, urban street lights, street furniture, trees, and other landscaping along Grant Ave will necessitate considerable construction funds. The Initial planning and design for the project has been funded, but there’s not yet any funding allocated for construction, and thanks to HB 2 and HB 599, which target road capacity expansions, neither the Virginia Commonwealth Transportation Board (CTB) nor the Northern Virginia Transportation Authority (NVTA) are likely to provide any money for a road diet. If construction will be locally funded, it’s unlikely that the curbs will be moved, so as to greatly reduce construction costs. At the meeting, Active Prince William advocated for alternatives–including buffered bike lanes–that could fit within the existing roadway. 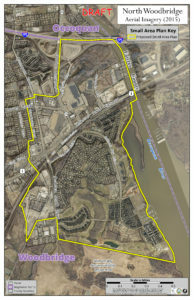 For more information, visit the City’s project page [http://www.manassascity.org/grantave], where you can sign up for project updates, and view the meeting presentation which provides background information and describes how the meeting was conducted.